More than 99 percent of cataract surgery patients have intraocular lenses (IOLs) implanted when the natural lenses are removed. 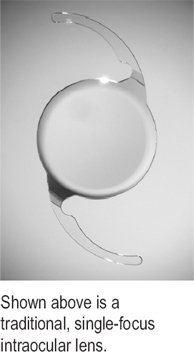 Since the cloudy human lens is removed from the eye during cataract surgery, it must be replaced by a man-made lens, the IOL, in order for the eye to recover vision. Modern IOLs are made of acrylic, silicone, or collagen polymers. They can be rolled or folded to fit through a very small incision. Once inside, they unfold to about a quarter of an inch in size. Side struts, called haptics, hold them in place within the capsule. The lens implants become part of the eye. They are safe, stable, and reliable, and they require no care or maintenance other than general practices for good eye health. Research and development are continually producing IOL refinements: Toric lenses to correct astigmatism, blue-blocking lenses to filter out ultraviolet and high-energy blue light, and aspheric lenses for better contrast sensitivity are just a few examples. Intraocular lenses fall into two general categories: single focus (standard) and full focus (premium). Imagine your range of vision as encompassing five zones, from nearest to farthest. Singlefocus lenses provide good vision in only one or two zones, whereas full-focus lenses enable you to see well in three to five zones. 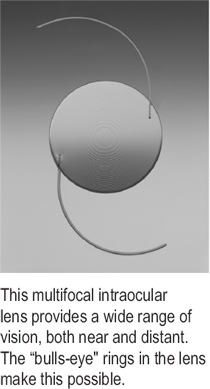 A single-focus IOL, also called a monofocal IOL-like a disposable camera lens-has a single fixed focal point, usually designed for mid-distance vision, so you'll need eyeglasses to see near objects and those farther than arm's length. Still, your vision will be better at some distances than it was before surgery. If you don't mind wearing glasses, monofocal lenses might work well for you. If you choose the standard single-focus IOL, you should be prepared to wear glasses for many or most activities. Full-focus IOLs are more like high-end Nikon camera lenses, automatically adjusting their focus to provide good near, mid-range, and distance vision without glasses. Many patients who choose full-focus IOLs can do almost anything they wish without glasses. Manufacturers of full-focus lenses use different technologies in the production of lenses. Multifocal IOLs have different focusing zones built into the lens, allowing a wide range of vision with decreased dependence on glasses. Since these IOLs work by dividing the light that enters the eye, they can produce glare and halos, particularly at night. Most IOLs, once implanted, remain in a fixed position within the lens capsule. Accommodating lenses, also called adaptive lenses, respond to contracting and loosening of the ciliary muscles, moving within the eye for smooth accommodation through the entire range of vision. The ciliary muscle changes the shape of the synthetic lens, just as it did with the natural lens while it was still flexible, before the onset of presbyopia. Though your vision will be better immediately after implantation of an adaptive lens, it can take up to a year for the ciliary muscle to get used to the new lens. During that time, you'll experience slight fluctuations in clarity of vision. Monovision refers to implanting IOLs in different strengths, making one eye more distance-dominant and the other eye more near-dominant. If the implants are premium accommodating IOLs, a wide range of sharp vision without glasses is possible. If you've successfully worn monofocal contact lenses, you might be a good candidate for monovision. The brain usually adapts to the difference in refraction. Very seldom are the results unsatisfactory, requiring corrective LASIK. If you and your doctor are considering monovision for your lens implants, he or she might want you to try wearing monofocal contact lenses for a while before your surgery. If you have had cataract surgery and you're not satisfied with the results, it's possible to implant new lenses on top of the existing ones. This process is called piggybacking. It can't correct every type of damage, and the best option is to choose your surgeon carefully so that the procedure will be done right the first time.